Merita Aneru at the 2018 Vodafone Hibiscus Festival at Valelevu Ground, Nasinu, on August 11, 2018. Photo : Simione Haravanua. 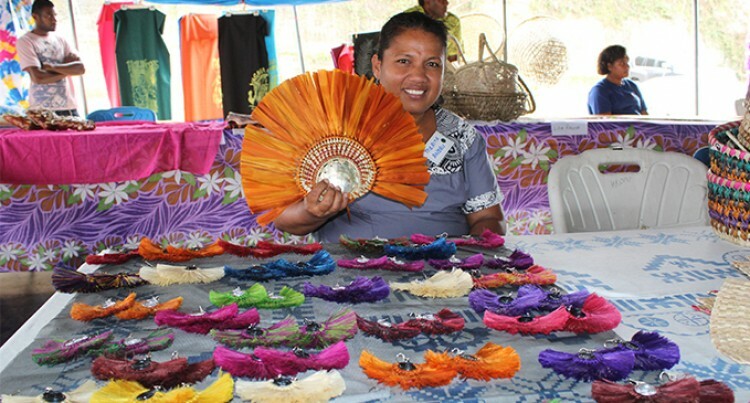 Merita Aneru has a heartfelt story about her journey to the National Craft Exhibition at Valelevu Grounds in Nasinu. She is also a registered artisan at 2018 National Women’s Expo and with the Fiji Arts Council. Although born in Kiribati, she came to Fiji to complete her high school education in Levuka. After she completed it she met and married a man from there. They stayed in Levuka for five years until she moved to Suva in 2005, in the hope of building a future for her children. She and her husband soon parted ways after he left for Kiribati to look for a job there. By this time it became hard to financially sustain her family. And although equipped with a Trade Diploma in Applied Computing at Fiji National University (FNU) she could not find a place for attachment. “I had nothing to do, so I was staying home and I came across a bunch of YouTube tutorial videos about jewellery making,” she said. “I began making ear rings and I found out that I was quite good at it. Ms Aneru started selling this to her friend, Toka Tane who is also an artisan. Ms Tane, who is half Tuvaluan and Kiribati, specialised in traditional jewellery and saw an opportunity to branch out her business to the Kiribati market. She now makes money by selling her jewellery to her friend, who later sells it at the market. The National Craft Exhibition coincides with Vodafone Hibiscus Festival, at the same venue.